We offer 3 duty types of piston (reciprocating) air compressors. They are the Heavy Duty Industrial (HDI), Standard Duty Industrial (SDI) in addition to HVAC Climate Control Compressors. 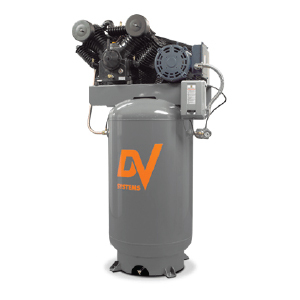 HDI Compressors (by DV Systems) are the workhorses of the industry. These piston air compressors are built with oversized components and extra heavy cast iron design. They run at extremely slow rpm’s. The pressurized lubrication system helps these units operate at a higher duty cycle. This lowers the operating temperatures thereby allowing these units to last for decades. Due to a higher duty cycle the unit will be able to produce more air over the course of a day. Furthermore, this significantly increases the life expectancy of the pump. In addition, they are manufactured right here in Canada as they have been for over 60 years. 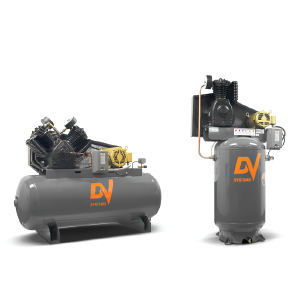 SDI Compressors (by DV Systems) while more economic are rugged and reliable compressors. They are ideally suited for the light industrial, commercial and professional user. All electric powered SDI piston air compressors (excluding IS40) come prewired with a magnetic starter. 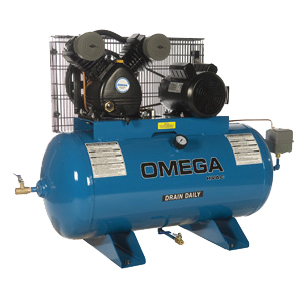 HVAC Climate Control Compressors (by Omega) are typically in the .5 to 5hp range and mounted on a 30 gallon air tank. These smaller piston air compressors are used in heating control systems, sprinkler systems and process that use a small volume of air but on a fairly regular basis. Depending on the use they may or may not be equipped with a magnetic starter. Many of these air compressors are available in both simplex or duplex configuration.